One of the most popular styles for weddings these days is the vintage. This doesn't look like fading anytime soon. The vintage look has also been popular to many brides because it adds a feminine and romantic touch that most women love. 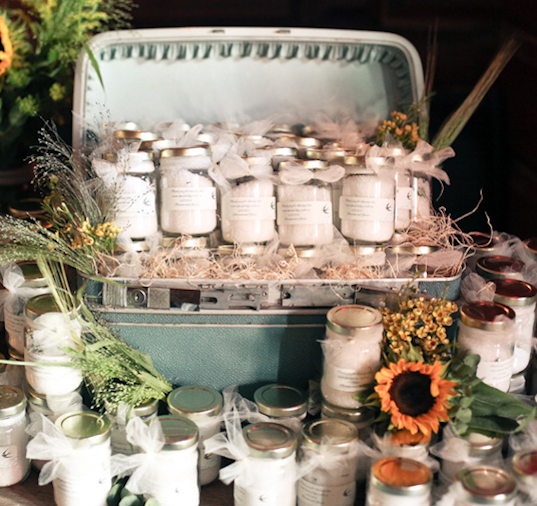 If your are planning a vintage-inspired wedding, there are some great ideas for your wedding favors to choose from. There are various elements that create a vintage look, one of which are peals. Whilst, giving each guest a string of pearls is not a good idea. Rather, you can just use the pearl as an inspiration to create a vintage-styled wedding favor. You might want to consider the color of pearls to your wedding favors. They come in different shades from pink, cream, to champagne and ivory. If you would like to use small favor boxes, there are available boxes made from a pearl finish card, with an elegant luster like pearls. 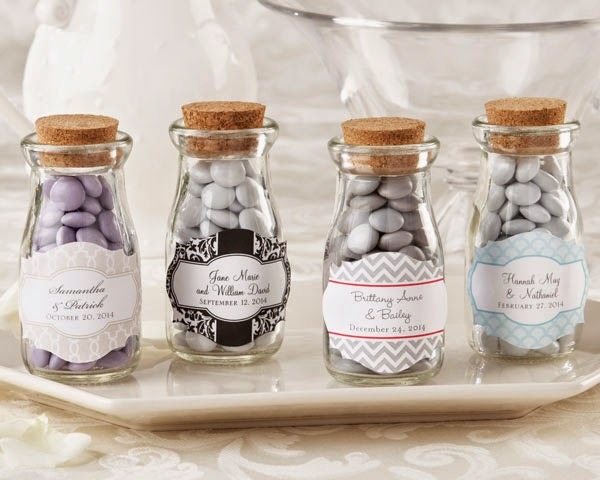 Pearl-like finish can also be applied to many other wedding favor ideas such as candles, soaps, coated almonds or candies, and foil wrapped chocolates. Ribbons, cards, labels, and tags in pearl finishes are also available in many different choices. These are perfect accessories that complete an elegant look of a favor box. You can also make some vintage-inspired colored favor boxes to package your little sweet treats for the guests. Use a wide paper ribbon in ivory color and wrap the box. You can further embellish the top of the box with an ivory colored paper flower and some greenery using your green colored wired that can be curled around a pencil. For a pearl finish, you can glue two or three pieces of pearl on the top of your decoration. 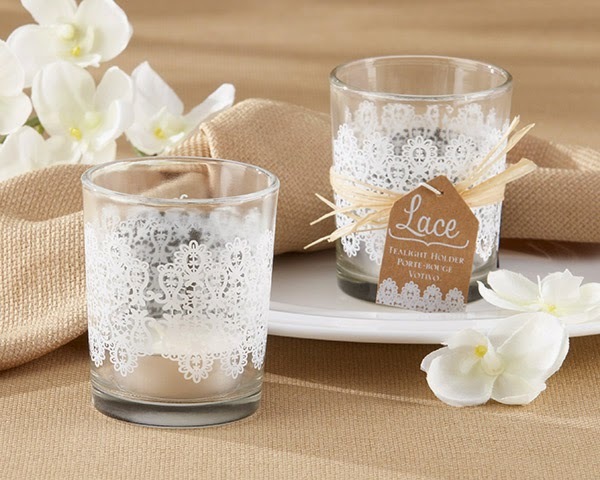 You might also consider laces to make your wedding favors look vintage. 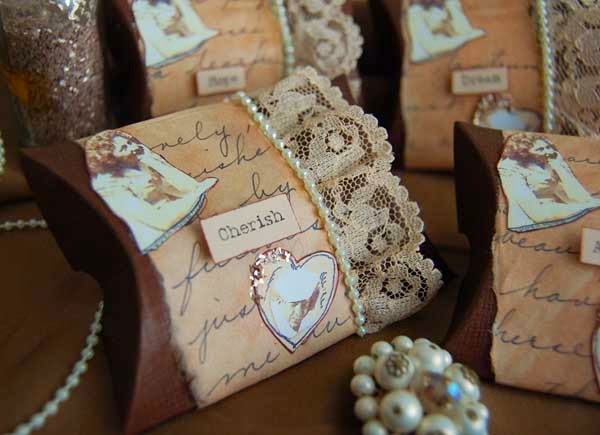 Scented sachets are great idea for such theme and are more beautiful if made or trimmed in lace. Scented sachets are very easy to make and you can make a simple template yourself. You can use a silk or satin cloth or an allover lace with a net bag at the bottom to secure the filling inside the sachet. There are various specialty stores, craft stores, and even antique stores where you can find cheap vintage-inspired items that you can use as wedding favors, including photo frames with scroll designs, crystals, and enamel. You may also consider compact mirrors, which also have a vintage appeal. These are perfect for your female friends and loved ones at your wedding. For your male guests, key chains in a similar style make perfect favors for them. Making your own vintage-styled wedding favors can be more focused on the presentation and packaging rather than the favor itself. Vintage colors are usually in pale shades of pinks, blues, and greens. Consider laces, pearls, crystals, or a few metallic details which is very popular nowadays, such as gold, copper, bronze and silver. The aforementioned supporting ideas to make a vintage look to your wedding favors can also be applied to your wedding decorations, wedding programs, wedding napkins, guest book, wedding cake, bridal ensembles, and etc.